Jump on the Big Rock! In 1999, Aaron Brochu, a former scup fisherman in New Bedford, acquired an agricultural grant to start an oyster farm in Dennis. After a visit to Cape Cod, Aaron decided he wanted to try his hand at this type of fishing. Boom. 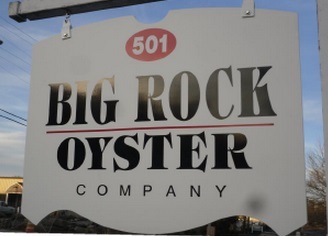 Big Rock Oyster was born…and thank goodness! Raise your hand if you love oysters! I have to admit, prior to this blog assignment, I didn’t know that oyster farms existed. I just assumed they were pulled from the ocean. The interesting thing to me is that when I worked in maritime law, we talked a lot about how over fishing and pollution can affect the sustainability of species and the sustainability of the fishing industry. And as you know, the fishing industry is very important here in Massachusetts. When I spoke with Aaron he told me that there are actually very few wild oysters left and that almost everything we eat is farm raised. At Big Rock Oyster they place oyster seed in a mesh “bag” and let them grow! They never take wild oysters, so sustainability is never an issue! Everyone wins! Mind blown? As an oyster consumer, I have wondered for years what makes oysters different. I mean, we’ve all seen them, small, large, salty, sweet, briney, crisp…the list of oyster characteristics goes on and on. But why…hoooooow? According to Aaron all of the oysters on the east coast are the same species. However, they take on the flavor and characteristics depending on the specific location they are grown. Salinity, bottom composition, water temperature all play a factor in their taste. The community of Harwich, where Big Rock is located, is very important to them. Bick Rock has 17 employees and is supported immensely by the community. 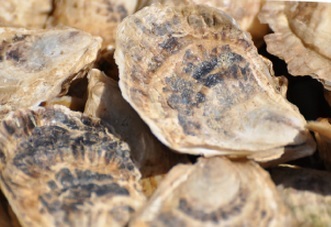 Not just because of their delicious oysters, but also because the land that they’re farming on is town and state land. You could really say that the company is part of the community and the community is part of the company. I asked Aaron if there was only one thing he could tell people about the company what would it be? He said, “We are extremely proud of what we do; and we love doing it. We work very hard and it shows in our oysters.” I’ve always said you can taste the love and hard work in someone’s food! Thank you Big Rock, for a product we can love too! Big Rock Oyster will be at the Boston Local Food Festival on September 14, 2014 with their Raw Bar. This is their second year attending the festival and they are very excited to share their goods! We’re excited to consume them Big Rock!!! If you get hooked on their oysters at the festival, and lets face it, you will, you can also rent their Raw Bar for events and functions. You can also go by their facility in Harwich where they’re selling approximately 1.7-2 MILLION of their oysters annually! Holy! I don’t know if you feel like an oyster expert yet, I sure do. Now where are the oysters? I’m staaahvin! July 24, 2014 in Company Spotlight, Grass Fed & Grain Free, Seafood.